When people talk about Korea, and it’s football this past year, invariably Japan seems to enter the conversation. The general consensus seems to be that while Korea has wallowed, and possibly regressed, under Choi Kang-Hee, Japan has gone from strength-to-strength under Alberto Zaccheroni. But, is this really the case? I decided to take matters into my own hands and scout Japan’s Confederation Cup matches to see how they fared against the various regional champions (and runner-up). To see their strengths, their weaknesses, and just how Korea stacks up in comparison. Each game will be looked at in brief in terms of Japan’s starting formation, tactics, and major noteworthy things from the match. Against Brazil, Japan went 4-2-3-1, their usual formation, but they made one important change. Kiyotake starts ahead of Maeda (who usually started in Japan’s World Cup qualifying matches). 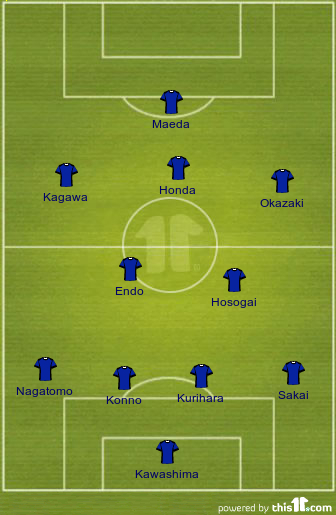 The result is that Okazaki moved up top with Kagawa, Honda, and Kiyotake across the midfield. The general consensus after the match was that Japan gave Brazil too much respect, and I generally think this is correct. Japan played a very stereotypical “Italian” game. They sat deep, allowed Brazilian possession, and looked to break on the counter. Neymar’s early goal should have resulted in a change in tactics and mentality, but it didn’t. For the first half, Japan continued to concede possession until Brazil penetrated Japan’s final third. The diagram above illustrates the rough positioning of Brazil and Japan when Brazil attacked. Neymar and Hulk would both drift inwards with Marcelo and Dani Alves creating the width. For Japan, Okazaki would drop into the midfield to help defend. Kagawa and Honda would stay high, with Kagawa moving to the left and Honda more central. Brazil’s strategy was effective for two reasons. 1) It played to their natural attacking strengths and 2) it nullified two of Japan’s major strengths. Brazil’s attacking strengths are fairly obviously Neymar, Hulk, and the two fullbacks. So, it was little surprise that they sought to maximize those areas. 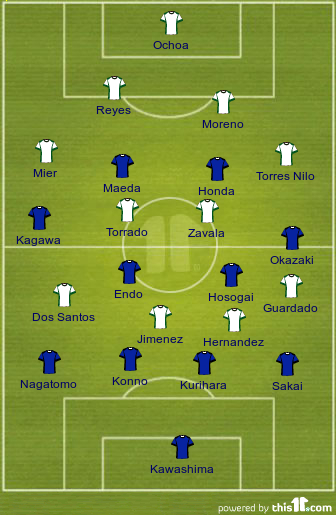 The major benefit was that it nullified to of Japan’s strengths, their fullbacks and the center midfield pair. 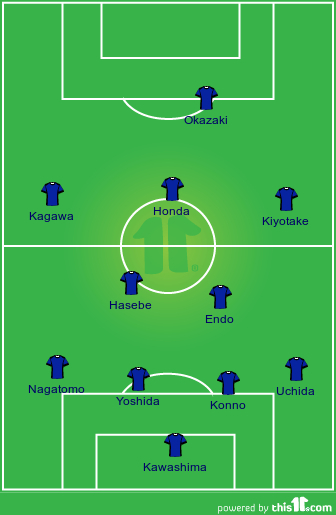 With everything going wide, Hasebe and Endo were forced to either drift way out of position (leaving more space for Brazil’s forwards and midfielders to exploit) or get passed by. It also didn’t allow Uchida and Nagatomo to get forward like they want to. After the break, Brazil went up 2-0, finally prompting a change from Zaccheroni. Maeda came on for Kiyotake (who had just earlier created Japan’s best chance), which moved Okazaki to the right midfield spot. 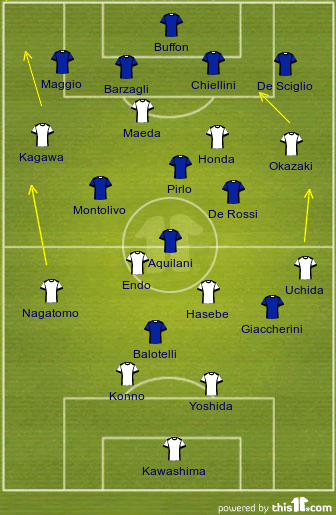 Japan continued with the same basic strategy, but their breaks were more effective with the team operating more on a 4-3-3 level as Maeda stayed higher. Kagawa and Honda were both able to find space behind the fullbacks, and Japan’s attack looked more cohesive if not actually being more productive. Something that is similar between the Korea and Japan is the question about the player mentality. Going against a traditional power (and in their home country) seemed to take it’s toll on Japan. The players seemed hesitant at times, and afraid of Brazil when they shouldn’t (for the most part). A key to keeping Japanese attacks at bay was Brazil’s strength down the flanks. With two quality wide forwards in Neymar and Hulk, and two quality fullbacks in Marcelo and Dani Alves, Japan was forced to keep their fullbacks in defense to prevent too much space from being opened up. In game 2, which will likely be the game of the tournament (and possibly the year) Japan fell to Italy in a battle of Italian coaches. Japan restored Maeda to the starting XI with Kiyotake dropping to the bench. In game two, Japan seemed to learn the lesson about not showing too much respect. Or possibly they just felt more confident that their coach, Alberto Zaccheroni, knew the Italian team inside and out (I think he’s coached every player at some point [not really]). Either way Japan came out strong and really put the Italians under pressure. Here is where we can see how a coach with good tactical knowledge is important. Italy has been playing a Christmas tree 4-3-2-1 lately under Cesare Prandelli. Against Japan they had Milan youngster Mattia De Sciglio and Napoli wingback Christan Maggio at fullback. A midfield three of Andrea Pirlo, Daniele De Rossi, and Riccardo Montolivo. And a trio of Mario Balotelli, Emanuele Giaccherini, and Alberto Aquilani in attack. 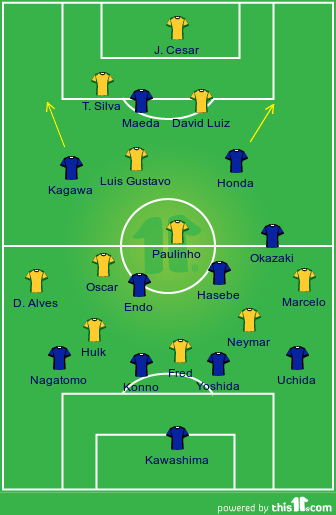 Brazil used their width to pin back the Japanese fullbacks, but the narrow 4-3-2-1 Italy used allowed Uchida and Nagatomo to get forward often. 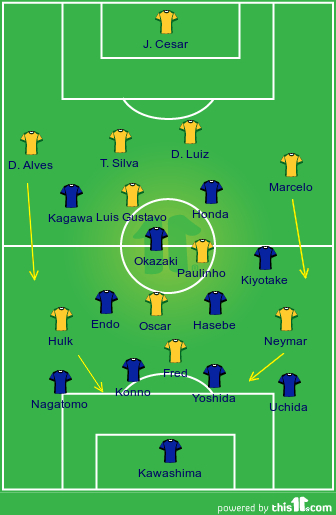 In essence it was a flip of the Japan-Brazil match, where Brazilian width caused Japan lots of problems. 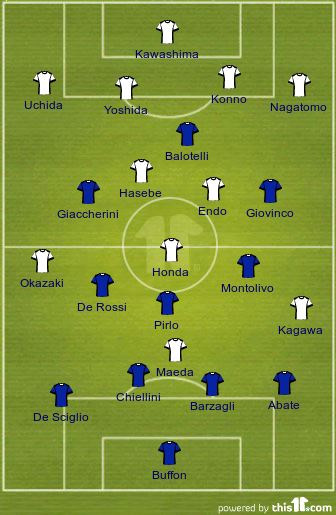 Here Japanese width caused many problems for Italy. Shinji Kagawa was excellent in this game, and part of that (besides his general quality) was due to the help he received from Yuto Nagatomo. Aquilani (starting ahead of Claudio Marchisio) did little to trouble Nagatomo offensively, and didn’t track him back either. Riccardo Montolivo the same. As such, Nagatomo was free to get up the pitch and overload Christian Maggio. Maggio also looked quite uncomfortable in a back four (he is a left wingback in Napoli’s 3-5-2). Andrea Pirlo was under constant pressure when he received the ball, getting caught in a triangle of Honda-Hasebe-Endo and wasn’t able to exert his usual influence. So, it fell to the centerback pairing of Andrea Barzagli and Giorgio Chiellini to get Italy out of trouble. Neither is a great passer, in the Juventus backline that job falls to Leo Bonucci (who was on the bench). The result is aimless long balls out of the back, which Konno and Yoshida dealt with comfortably. Japan’s first goal had a sniff of luck as Buffon seemed to get the ball before taking out Honda, but the penalty was awarded anyway. The second was a wonderful goal by Kagawa, after some poor defending for Italy following a set piece. With Japan up 2-0 and dominating the game, it seemed like the result should have been in the bag. The question was would Japan ease off and allow Italy a chance? The answer was, ‘yes’ sort of. Cesare Prandelli made one change early, with the thus far Aquiliani coming off and Sebastian Giovinco coming on. The move made sense as Giovinco is a more natural wide player. Italy pulled one back through Daniele De Rossi from a corner, and almost leveled right at the half with Giaccherini hitting the post. The match was completely turned on it’s head in the second half. Some sloppy Japanese defending allowed Giaccherini to win the ball at the end line and turn in towards goal. His driven cross was turned in by Uchida to level things. Shortly after the referee gave a harsh handball penalty against Hasebe. Hasebe stretched to block the ball, it hit him, bounced under him, and then hit his trailing hand. Most likely a make-up call for the slightly harsh penalty in the first half. Balotelli converted and suddenly Italy was ahead. The game went back and forth from there. Japan leveled through Okazaki, but a late Italy goal by Giovinco sealed the points for Italy and eliminated Japan from the semi-finals. In the end, it would seem that Italy’s depth and experience (and a bit of luck) earned them the win. Prandelli’s starting formation was off, but the changes he made were important. Giovinco brought on a more natural wide forward, Abate a more natural fullback, and Marchisio a technical, box-to-box midfielder. Japan will, and should, feel a bit hard done by the end result as a draw would have been a more fair result. Once again, the mental strength of Asian teams must be called into question. While Japan didn’t look as awed as in their first match, once Italy scored, I wondered if that would cause Japan to crumble. They didn’t, but they still looked less assured, particularly on defense. Japan’s final match in the Confederations Cup featured the two eliminated Group A teams, Japan and Mexico. Both had lost to Italy and Brazil, so neither had anything to play for other than pride. Japan made three changes to their starting XI with captain Makoto Hasebe missing out through suspension, and Atsuto Uchida and Maya Yoshida making way. In their place were Hajime Hosogai, Hiroki Sakai, and Yuzo Kurihara respectively. This match resembled the Brazil game a bit, as like Brazil, Mexico’s strengths are down the flanks, particularly with their two wingers Gio Dos Santos and Andres Guardado. The general flow of the game was similar to Brazil, with Mexico looking to go wide, and Japan relying on the break. Japan wasn’t as conservative as they were against Brazil, and so they looked a bit brighter (but not as good as they did against Italy). Without the ball, Japan dropped into their 4-4-2 shape with the only difference being that on the left, Kagawa was the one to drop into midfield with Maeda staying high. This limited Kagawa’s influence on the break as he started from a much deeper position, and didn’t have time to get forward. Otherwise it was basically 4-4-2 vs 4-4-2, mano a mano, and neither team created too many chances. Japan had a goal disallowed for a close offside call on Okazaki, and Guardado missed the best chance in the first half when his free header hit the post. Not too many changes came in the second half. Mexico scored twice through Javier Hernandez. His first was a free header at the near post when he lost his marker and beat Kawashima. His second from a corner. Neither were particularly brilliant, but Mexico had been the better team thus far and deserved there lead. Japan would pull one back late through Okazaki, and Hernandez missed his chance to complete his hat-trick when he failed to convert a penalty in stoppage time. While Mexico is similar in style to Brazil, they tend to be a bit more direct. Torrado and Zavala are more defensive midfielders, so when Mexico attacked, the ball pretty much bypassed them or they quickly passed it to either Guardado, Dos Santos, or Jimenez. Mexico’s lack of a creative midfielder made their attacks a bit predictable, and again, turned most attacks into one-on-one battles (forward vs defender, wide forward vs fullback). It seems fairly clear from these three matches what Japan’s strengths and weaknesses are. When their fullbacks can get forward, the midfield pair of Hasebe and Endo are involved, and Kagawa can get the ball in advanced positions, Japan can compete with the best in the world. But against strong teams that play with width, such as Brazil and Mexico did, they become a bit more average. The team is good technically from front to back, and well organized. Japan’s challenge will be can they develop their play where they can impose their style on quality teams, rather than reacting the opposition. In the next installment, we’ll compare how Japan utilizes their strengths and weaknesses, and how Korea does the same (or fails to do so). I watched the Italy-Japan game – poor officiating all around, I thought. Neither penalty should’ve been given – Buffon clearly got the ball and barely touched Honda, and the Hasebe handball was ridiculous. But additionally, the second Italian goal should have been ruled out as a handball as well – Giaccherini recovered the ball off the endline with his upper arm. Now, I get the argument for deliberate or not deliberate, and it’s not exactly clear either way. On the other hand, I’m generally of the opinion that even if it’s not technically written so in the books, the officiating should take into account the situation as well. Intention is a tricky thing to judge in the heat of the moment, but if one team recovers the ball less than two meters from the opposing goal via a handball, I’d whistle that dead whether or not it was deliberate. Because odds are – it probably was. In Giaccherini’s case, his head is looking away from the ball, but his right arm is sticking out away from his body a little oddly and very conveniently to tap the ball back into play. I agree that both penalties were harsh, and am quite sure the one against Hasebe was a pure make-up call. I don’t think Giaccherini’s was handball, but like you said the line between deliberate and accidental is very fine.